The DC-3 had delivered mail to Saint Thomas (STT) and was prepared for positioning flight back to San Juan, Puerto Rico. The first officer was flying the airplane. The takeoff roll and rotation at 84 knots was uneventful until about 100 feet above the ground when the gear was called out to be retracted. At that time, the left engine's rpm dropped from 1,800 to 1,000. The captain stated he communicated to the first office "I have the plane". The left engine's propeller was selected for feathering. The airplane would not maintain altitude and airspeed. 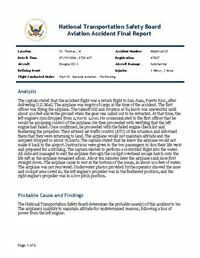 He instructed the first officer to confirm that the gear was retracted. The captain knew the airplane would not make it back to the airport and instructed the passengers to don their life vests and prepare for a ditching. The aircraft was ditched in the ocean and remained afloat. All occupants exited the airplane into a life raft. PROBABLE CAUSE: "The airplane's inability to maintain altitude for undetermined reasons, following a loss of power from the left engine." Distance from Saint Thomas-Cyril E. King Airport to San Juan-Luis Muñoz Marín International Airport as the crow flies is 108 km (68 miles).